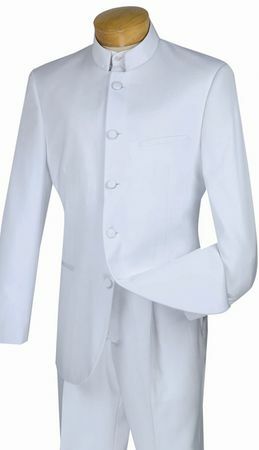 Do you appreciate the style and fashion that white Nehru collar suits have over other style suits. That Stylish look that shows style and appreciation of mens fashion that a regular suit just can't provide. Vinci makes the type of White Nehru collar suit for you. With pleated pants that are nice and baggy and show the right amount of your shoes and a 32 inch long jacket with 5 buttons, this suit has the swagger necessary to make your style come alive like never before.